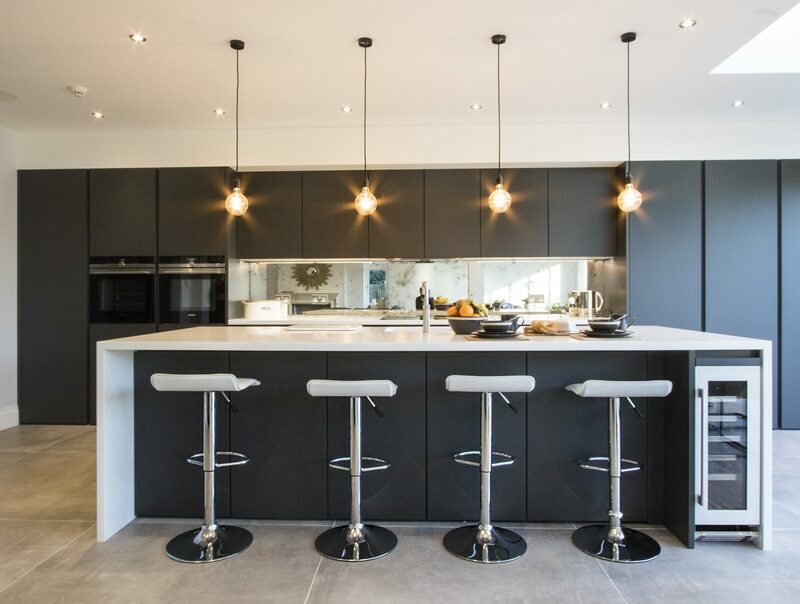 View our latest projects in Kew, what kitchen, appliances and accessories brands have been used to create those amazing designs, you can also view customers reviews on these designs. This fabulous Handless Kitchen in a bold shade of grey inspires and stimulates the senses. The contrasting colours encourage one to indulge in mystery and drama. The dark tones of the units meet the cool nuances of the stylish Corian Ice White wraparound of the island, accentuating the contrasts between shiny and matt. If Kitchen colours are made to affect how we feel, this one doesn’t disappoint. Dark tones give warmth and drama. Light tones bring excitement and liveliness. Together, they create an environment that is fresh, inviting and extremely elegant. But the biggest “wow” factor in this Kitchen is undoubtedly the dazzling Antique Mirror Splashback, with its distinctive distressed vintage look. It’s no short of spectacular and certainly works as a strong focal point. The reflective layer is the perfect tie between the contemporary and the vintage look. Moreover, the splashback has been toughened for extra safety, as it has been positioned next to a heat source. For added efficiency add practicality, the owners have opted for a Fusion Square Quooker Tap. This hot water tap not only looks great, but it ensures instant boiling water at the turn of a lever, and saves valuable worktop space. The Kitchen appliances are all integrated to help carry the minimalistic modern look. The utility room has been brought to life by the crispy white handleless units. A simple approach with space-saving ideas and plentiful storage was the key to pull off this look. This is another successful project completed by Richmond Kitchens. Kitchen Design by Mehdi Sakhri.